The plant cell has many different parts. Each part of the cell has a specialized function. These structures are called organelles. This diagram shows the various parts of a plant cell. Specialized structures in plant cells include chloroplasts, a large vacuole, and the cell wall. Chloroplasts are found only in plant and algae cells. These organelles carry out the process of photosynthesis, which turns water, carbon dioxide, and light energy into nutrients. They are oval-shaped and have two membranes: an outer membrane, which forms the external surface of the chloroplast, and an inner membrane that lies just beneath. Between the outer and inner membrane is a thin intermembrane space about 10-20 nanometers wide. Within the other membrane, there is another space called the stroma, which is where chloroplasts are contained. Chloroplasts themselves contain many flattened disks called thylakoids, and these have a high concentration of chlorophyll and carotenoids, which capture light energy. The molecule chlorophyll also gives plants their green color. Thylakoids are stacked on top of one another in vascular plants in stacks called grana. Plant cells are unique in that they have a large central vacuole. A vacuole is a small sphere of plasma membrane within the cell that can contain fluid, ions, and other molecules. Vacuoles are basically large vesicles. They can be found in the cells of many different organisms, but plant cells characteristically have a large vacuole that can take up anywhere from 30-80 percent of the cell. 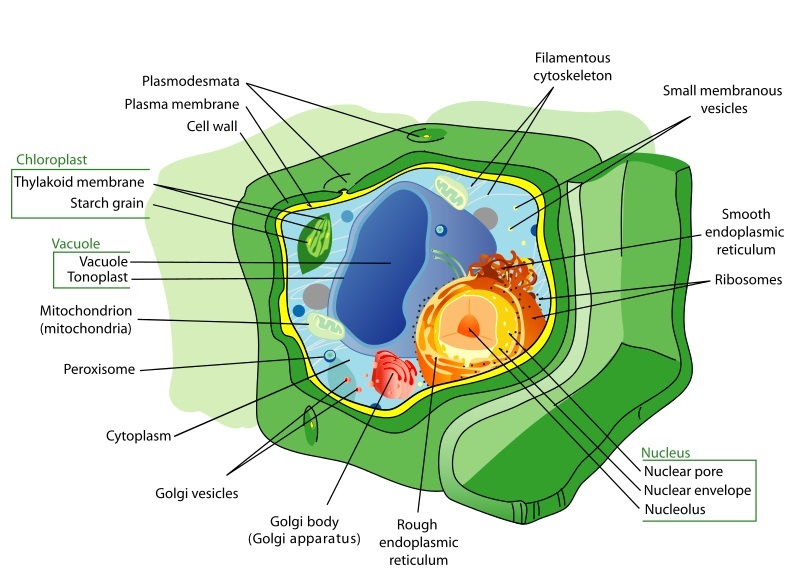 The central vacuole of a plant cell helps maintain its turgor pressure, which is the pressure of the contents of the cell pushing against the cell wall. A plant thrives best when its cells have high turgidity, and this occurs when the central vacuole is full of water. If turgor pressure in the plants decreases, the plants begin to wilt. Plant cells fare best in hypotonic solutions, where there is more water in the environment than in the cell; under these conditions, water rushes into the cell by osmosis, and turgidity is high. Animal cells, on the other hand, can lyse if too much water rushes in; they fare better in isotonic solutions, where the concentration of solutes in the cell and in the environment is equal and net movement of water in and out of the cell is the same. The cell wall is a tough layer found on the outside of the plant cell that gives it strength and also maintains high turgidity. In plants, the cell wall contains mainly cellulose, along with other molecules like hemicellulose, pectin, and lignins. The composition of the plant cell wall differentiates it from the cell walls of other organisms. For example, fungi cell walls contain chitin, and bacterial cell walls contain peptidoglycan, and these substances are not found in plants. The main difference between plant and animal cells is that plant cells have a cell wall while animal cells do not. Plant cells have a primary cell wall, which is a flexible layer formed on the outside of a growing plant cell, and a secondary cell wall, a tough, thick layer formed inside the primary plant cell wall when the cell is mature. Plant cells have many other organelles that are essentially the same as organelles in other types of eukaryotic cells, such as animal cells. The nucleus contains a cell’s deoxyribonucleic acid (DNA), its genetic material. DNA contains instructions for making proteins, which controls all of the body’s activities. The nucleus also regulates the growth and division of the cell. Proteins are synthesized in ribosomes, modified in the endoplasmic reticulum, and folded, sorted, and packaged into vesicles in the Golgi apparatus. Mitochondria are also found in plant cells. They produce ATP through cellular respiration. Photosynthesis in the chloroplasts provides the nutrients that mitochondria break down for use in cellular respiration. Interestingly, both chloroplasts and mitochondria are thought to have formed from bacteria being engulfed by other cells in an endosymbiotic (mutually beneficial) relationship, and they did so independently of each other. The liquid within cells is the cytosol. It is mostly made of water, and also contains ions like potassium, proteins, and small molecules. Cytosol and all the organelles within it, except for the nucleus, are called the cytoplasm. The cytoskeleton is a network of filaments and tubules found throughout the cytoplasm of the cell. It has many functions; it gives the cell shape, provides strength, stabilizes tissues, anchors organelles within the cell, and has a role in cell signaling. The cell membrane, a double phospholipid layer, surrounds the entire cell. Plant cells are the basic building block of plant life, and they carry out all of the functions necessary for survival. Photosynthesis, the making of food from light energy, carbon dioxide, and water, occurs in the chloroplasts of the cell. The energy molecule adenosine triphosphate (ATP) is produced through cellular respiration in the mitochondria. Like all multicellular organisms, each cell within an organism has its own unique role. Some plant cells function solely in the production of glucose, while others are needed to carry nutrients and water to various parts of the cell. Read the following section for more about different cell types and their functions. Parenchyma cells are the majority of cells in a plant. They are found in leaves and carry out photosynthesis and cellular respiration, along with other metabolic processes. They also store substances like starches and proteins and have a role in plant wound repair. Collenchyma cells provide support to growing parts of a plant. They are elongated, have thick cell walls, and can grow and change shape as a plant grows. Sclerenchyma cells are hard cells that are the main supporting cells in the areas of a plant that have ceased growing. Sclerenchyma cells are dead and have very thick cell walls. Xylem cells transport mostly water and a few nutrients throughout a plant, from the roots to the stem and leaves. Phloem cells transport nutrients made during photosynthesis to all parts of a plant. They transport sap, which is a watery solution high in sugars. There are several important structural elements within plant cells that allow plants to stand, gather sunlight, and grow as a single organism. The most important components within the cells to achieve these ends are the cell wall and the vacuole. Together, these two structures within plant cells create rigidity, which allows plants to stand tall and not fall over. Specifically, the vacuole fills with water, pushing on the cell wall. This creates internal pressure, called turgor pressure. The cell walls experience this pressure. In turn, each wall exerts pressure on the wall next to it. Together, this holds the plant up much like the skeleton of a human provides support. However, plants need a steady supply of water to keep this pressure up. Without water, the vacuoles will quickly lose water. Without pressure, the cells cannot push against each other. Thus, a thirsty plant will wilt, tip over, and eventually die. 1. Which of these are found in plant cells, but not in animal cells? 2. What molecule is mainly found in plant cell walls, but not in the cell walls of other organisms? 3. Plant cells survive best in _______ solutions. 4. You find a new species organism that does not look like a plant, and animal, or fungi. Upon inspecting a cell from the organism, you find that it has a cell wall and chloroplasts. Which group of organisms would you classify this new species with? 5. Animals use mitochondria to produce energy, through the process of aerobic respiration. This process breaks down glucose to make ATP. Plants create glucose through the process of photosynthesis within the chloroplasts. How do plants utilize this energy source? C. Plants do not use glucose, only create it.